Spring is almost here in the Northeast US, and I am getting ready to start riding and working on the bike again. 2) Add lights and mods to the front for more safety – I rode a few miles in January and two cars pulled out right in front of me. a) I added arrow turn signals to the mirrors facing forward. b) I added a switch and flasher so I can run front flashers when driving on two lane roads (which are more dangerous than divided highways). It is only two small LED lights – I did not want it to be too strong of an effect, as it might confuse people. I was thinking about adding a JC Whitney modulator to the high beam which I would use only when approaching dangerous intersections – I would not leave it on continuously. update 3/28/12 – Due to bumps in the road, both my headlight and my Walmart driving light flicker as I drive. For now, I do not think I need a headlight modulator, since the lights flickering is a little bit of that effect. To get a reduced headlight modulator effect at no cost, loosen the headlight mounting bolts a little. 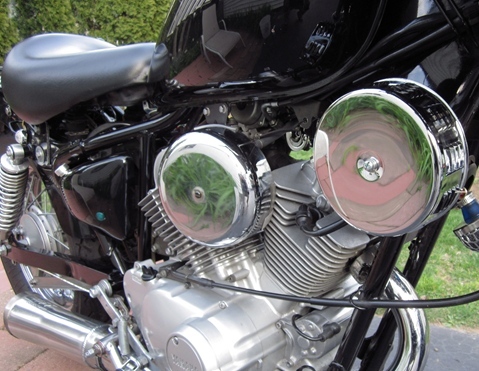 This is good for bikes like the Virago 250 that have a very solid headlight mounting – I would not do this if your headlight is already mounted a little loose. Just loosen the bolts – do not remove them – and then secure them (safety wire) so they do not become more loose. Do not over-do it – ask a friend to drive toward you to make sure the flickering effect is not excessive. If you do it just right, the flickering is almost as effective as a real headlight modulator. 3) The remaining weaknesses that I need to fix are that I need more rear turn signals and my Walmart driving light has a beam that is too broad and not well focused – so it does not light up the road very well. *** Most bikes have insufficient turn signals, side lighting, and rear lighting. b) Add a brake light flasher. c) Increase the brightness of your turn signals by about two times. I just started using an orange reflective vest. Yellow is the “safest” color so I usually get yellow but I thought that I would try a different color. update 5/03/12 – This is important – I have used this orange reflective vest for over 2,000 miles now – and just one driver has pulled out in front of me (plus I do not get tail-gaters now). I have seen many drivers start to change lanes, and then they see me and do not make the lane change. People pulling out in front of us keeps motorcycle drivers sharp and more ready for the next one – so I have to make sure that I keep my guard up. update 6/18/12 – I have used this orange reflective vest for over 3,000 miles now and three drivers have pulled out in front of me. Each of these three was beside me and pulled into my lane at an angle, so that I was in their blind spot. So now I have to think about how to improve visibilty when I am in other driver’s blind spot. You might think that you will look goofy wearing this – but after you see how other drivers respect you more when you are wearing a reflective vest, the look will not matter to you anymore. I do a few more things that can make drivers notice me better: I wear a white helmet, and I have a white front license plate (black letters) and two front auxilary driving lights (white now, but someday I will go to yellow). 4) I might go to a lithium battery. The proper size lithium battery is too much money to stay within my “minamalist/low cost” plan. A 4 amphere hour battery as used in mopeds might work if I make these changes: Put LED bulbs in my turn signals and tailight. Put an LED H4 bulb in my headlight; this will only be bright enough to be “daytime driving lights”. I do not drive at night much, but if I do, I can switch on my Walmart 55w halogen driving light. Crank bike only with the lights off. 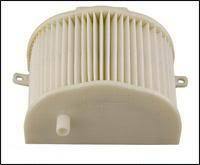 Add a switch to turn off the carb heaters; they are needed below 51 degrees F – I can switch them on when needed. Mine has two – one is 30 watts and the other is 20 watts – I might put them on two different switches so I can experiment with them. When using turn signals, turn them off as soon as possible. Increase the idle speed a little to increase the stator output when idling. Disconnect the 3 watt speedo illumination bulb or replace it with an LED. Disconnect the turn signal cancel sensor in the speedometer (my bike did not have the other components of that feature anyway.) Add a switch for the tailights so I can turn them off if I run short on voltage. With a lithium battery, my battery weight will go from 9.5 lbs to 0.5 lb (4.3 kg to 0.2 kg). Also I am trying to lose 20 lbs myself (lost 11 lbs so far); if I succeed, the bike’s total weight will be reduced by 29.0 lbs or 13.2 kg, and my 22 hp Virago 250 would perform as though it had 23.3 hp. update 3/27/12 – I decided to wait on this due to the expense, and to the complexity of charging lithium batteries. I had planned on buying four 18650 LiFePo4 lithium batteries for $13.80 which would provide 7.2 amp hours total. I will think about it again when I learn more about LiFeP04 batteries and when I am tempted again by the thought of lightening the bike by 9 lbs. update 4/15/12 – I keep thinking about this, so I guess a lithium battery is back on my list. An 8 amp hour (135 CCA) lithium battery is for 550 cc bikes and smaller. A 4 amp hour (80 CCA) lithium battery is “borderline” for a 250 but I still think it will work (with the changes I will make). update 4/20/12 – Another good choice is an AGM Gel battery. I have to decide…. 5) I recently removed the chrome head covers from the engine (for details, see this post http://wp.me/p1LWaM-h3 ). I need to grind some of the rough edges of the brackets where I broke them off. 6.5) Polish the right side cover, left side cover, and the black rear exhaust pipe. I always wanted to buy the chrome engine side covers but they are close to $100 each. I am 90% completed with the right one and it is close to chrome. It will take me about 12 hours to do the right cover – using 400 grit, steel wool (coarse, medium, fine), then polish – but I tend to go to polish too soon – which makes it take a lot longer – I should use the sandpaper and steel wool longer. For difficult pieces like the engine side covers (which are painted), the steel wool part goes faster when the engine is very hot – but wear heavy gloves, be careful, and avoid the exhaust pipes – it is very easy to get burned. 7) Adjust the valves. This will be a little easier since I have removed the chrome head covers, brackets, and a few mounting tabs. 8) Change or clean the air filter. It is only a year old, but my car and my other bike had big performance improvements after I changed the air filter, so maybe the air quality is not so great around here. My car has been down about 20 horsepower for six months, and the air filter was the problem. Also, I just changed the air filter on my wife’s car – and it also has more power now. update 3/27/12 – My airfilter did not look too dirty, but since I am running rich (when I pulled my muffler plates out they were soot covered) I am going to a larger filter. I replaced my old 18 square inch (surface area) Triumph air filter with a 34 square inch air filter from a Yamaha Roadstar 1600. It sticks sort of far out as I had to make a 3 inch to 2 inch adapter – this is just temporary as I will be getting a 31 square inch VW filter soon (cost $17.95). The two-inch air filters from the old VW’s will fit the Virago 250 and are fairly inexpensive – they are about 3mm “too big” so you need a strip of thick tape or rubber to mount it. I have ridden the bike four times since then and, with the larger air filter, there seems to be a performance increase. I have now received the VW filter, it uses a foam element, so I have to get some air cleaner oil before I can put it on. I’m curious how it is going to look – you don’t see louvered stuff on Virago 250’s very often. 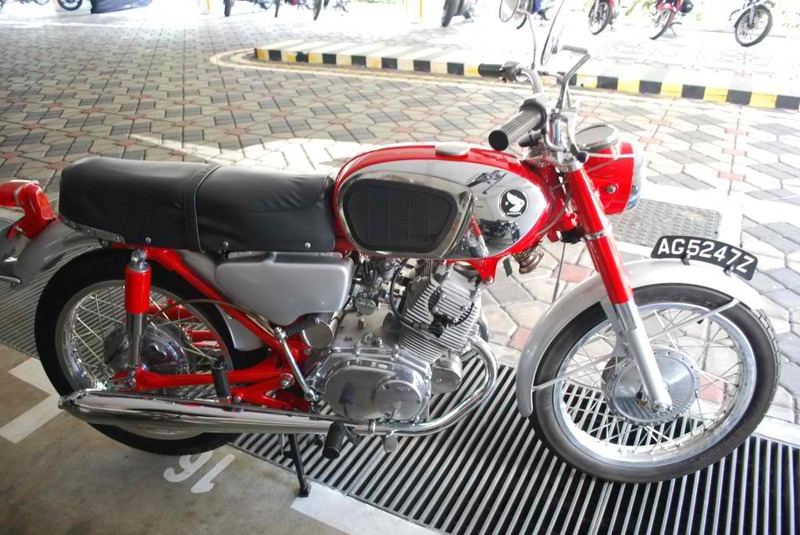 9) Move the ignition switch to below the front of the tank – where they were on many bikes forty years ago. The switch would be more convenient if I moved it up near the speedometer, but it is less secure there. Putting the ignition switch below the tank is more secure than even the original mounting, since the wiring can be covered by the tank. When mounted below the tank, the switch is much easier to use than in the original position. When I reach over to the left side to turn the key, it reminds me of my CB-160. Edit 3/11/12 – I mounted the switch – please see picture above. I still need to route the wiring better – I will do this when I remove the tank to adjust the valves. 10) Make a fairly secure carrying space in the fairing. I moved the speedometer up and back about 6 inches behind the handlebars, moved the indicator lamp panel to the right side of the speedometer, moved a light switch out of the way, and raised the fairing up about 1/2 inch. I put in a nylon bottom and used some plastic netting for the sides. The capacity of this space is 1,350 cubic inches. Since the top is open, it will actually hold 1,650 cubic inches. My fender bag is 1,500 cubic inches, so I have doubled my carrying capacity. If you have ever seen the storage bins built into the Vetter fairings, you will probably agree that this is huge for a fairing compartment. I just used materials that I already had, so the cost was zero. The speedometer is a little harder to see – this is made worse because my riding stance is leaning forward. I found out that leaning forward almost eliminates back injuries due to hitting large bumps. Also, if you push yourself up with your arms and legs it helps even more. 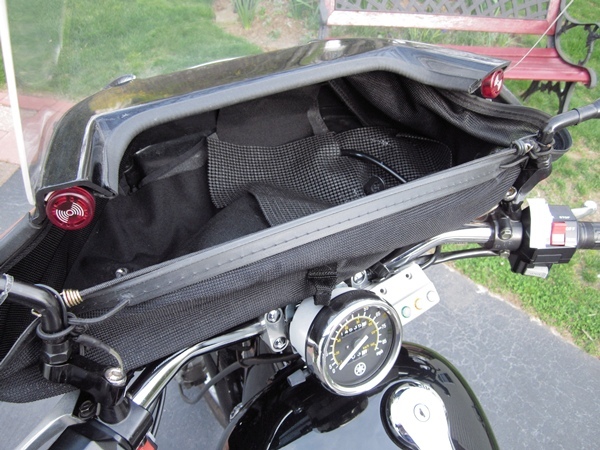 Since I now have the fairing storage, I usually leave my fender bag at home – then I can go back further on the seat which makes it more comfortable plus I can see the speedometer better. update 4/21/12 – Today I removed the headlight and mounted it below the fairing. Actually I just flipped it over and mounted it upside down using the same bracket. I will add a much smaller headlight to the original area but in a more forward position in the fairing. If you are thinking about doing this, check your local laws. Keep in mind, too, that I am an experimenter and I do things sometimes that would not seem logical to the average person. Moving the headlight outside of the fairing opened up more storage space in the fairing – it will hold 2,100 cubic inches now (I also angled the windshield more forward). update 4/23/12 – OK, flipping the headlight over is not a good idea, unless you can avoid all bumps. There is not enought room for the front shocks to compress more than one inch. Now I am going to mount the headlamp outside of the fairing – it will be where it was originally but moved forward seven inches. The brackets that I removed reduces the bike’s weight by 11.2 ounces. So far I have reduced the bike’s weight by about 30 pounds. I have moved the fairing forward (both the lower and upper bracket), moved the headlight trim panel more forward, re-routed some wiring, and removed 1.375 inches of the triple tree where it went around the speedometer – all these makes the space hold more – the capacity is now 2,200 cubic inches. update 8/7/12 – I moved the fairing forward again (the upper bracket by .5 inch and the lower by 1 inch) – the capacity is now 2,500 cubic inches. Adding this carrying capacity did not add any weight to the bike. 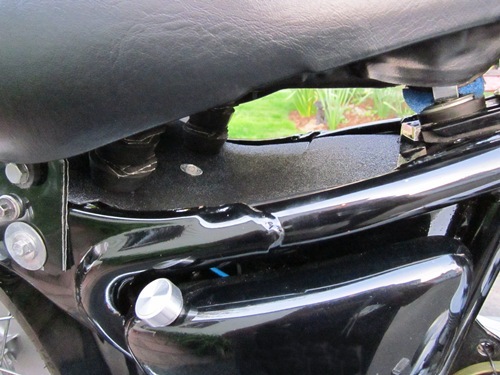 If you own a Virago 250 with a Rifle Sport fairing, you might want to consider doing this. 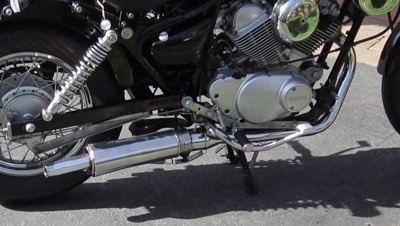 If you do these two things – 1) move the speedometer up and back about 6 inches behind the handlebars and 2) move the headlight outside of the fairing – it will open up a large storage space in the fairing – approx 1,800 to 2,500 cubic inches depending on how forward your windshield is mounted and angled. 11) added April 15, 2012 – Organize and cover wiring under seat so I can use that space for storage. I have raised my seat up, so I have about 2 inches of space there. 12) Adjust the pilot screw. The Virago 250’s seem to do best when the pilot screw is somewhere between 3/4 turn and 1 turn out. Update 4/10/12 – I set the pilot screw to 3/4 turn out and the bike does run smoother, seems faster, and goes up some hills in 5th that needed 4th before. But, it stumbles at low rpm and pops on deceleration – so I need to fix the exhaust leaks and check the intake manifold for leaks – if that does not fix it, then I might try the pilot screw at 1 turn out. Update 5/01/12 – Last night I set the pilot screw to exactly 1 turn out, but I could not drive it to work today because of rain. I kept trying different TV stations in hopes to find one that said no rain, but no luck. edit Oct 6, 2012 – I seldom do things based on looks, but today I changed back to the Supertrapp endcap. I only used 4 rings and I removed 40% of the middle two rings to make a bottom-facing slot (so most the noise will do downward away from the rider). I just did a short test run but I think the “bottom-facing slot” is almost as good as “rear-firing” in reducing exhaust noise to the rider. 14) I also disconnected the two carburetor heaters. It is more cold-blooded now on some start-ups, but after a few seconds , it runs fine. So for spring-time in Northeastern U.S., not having carb heaters is not a problem. I do not know if the carburetor heaters have an effect on engine performance. update 4/24/12 – This morning was the first time below 50 degree F since I disconnected the two carb heaters, and the bike was stuttering, especially at low rpm, and it would catch and run pretty good. It did not get any better even when the bike was fully warmed up (my commute is 1.25+ hours each way). I think this is the carb heaters – I have to test it more. update 4/25/12 – I re-connected the two carb heaters. This morning it was 42 degrees F and the bike started right up and immediately idled great. The bike ran great – the stuttering problem was 90% gone. Mileage went from 80.3 mpg without the heaters to 85.5 mpg with the heaters. Temps here now run between 40 and 65 degrees F. In the summer it is 55 to 80 degrees F and I get around 92 mpg. The sensor functions like a simple on-off switch for the carb heaters – there is no circuit or computer chip involved. I added an LED to mine, so I will know someday what that exact temperature is ……………. 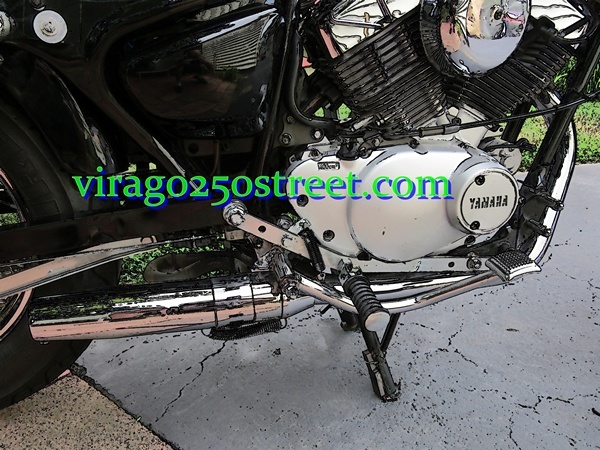 The Virago 250 carburetor heaters are needed below 59 degrees F (15° C) – if disconnected, bike could misfire, lose some power, and possibly use more fuel. The carb heaters can be disconnected if the temperature does not go below 59 degrees F.
Actually, I do not even need the indicator LED, as the voltage meter drops from 13.3 volts to 12.8 volts when the carb heaters are “on” (they use 50 watts). The Virago 250 carb heater sensor functions like a simple on-off switch and is set to turn “ON”at about 51° F or 10.6 C and “OFF” at 58° F or 14.4°C. So at 51°F and below the carb heaters are “on” – and at 52° F (11.7°C) or higher they are “off”. My bike has two carb heaters – combined they use about 50 watts – my voltage meter drops from 13.3 volts to 12.8 volts when the carb heaters are “on”. (On the SRV250, the sensor turns ON at 8° C ±3° C and OFF at 13 C°±5° C.
15) Add an aluminum knob and fake sight-glass to the right plastic side cover to look like an oil tank. 16) Change my fuel pump cover (6 inch chrome air cleaner cover) to something different. 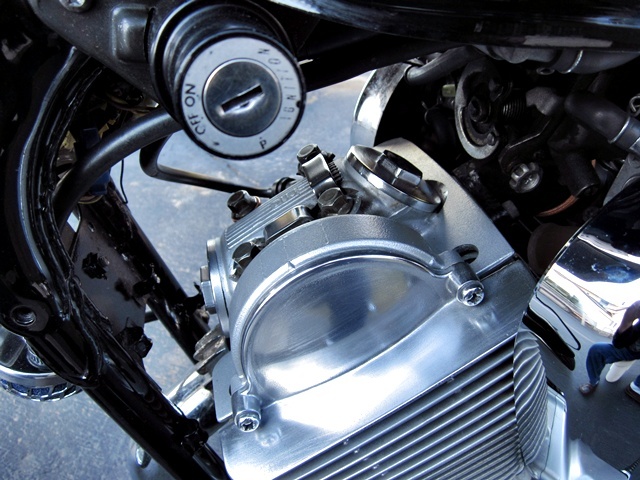 In my opinion, covering the fuel pump with a chrome air cleaner cover is one of the best bang-for-the-buck changes you can make to your Virago 250. In other words, it is easy to do and it dramatically changes the look of your bike. Removing the chrome head covers makes the engine look a little smaller, so I am going to try to find a chrome cover somewhere between 4 ½ and 5 ½ inches in diameter. In my opinion, six inch diameter (152 mm) is the largest size fuel pump cover to put on a Virago 250, and the optimum size is about 4.5 to 6 inches (114 to 140 mm). A chrome cover less than six inches will help to make the engine look bigger. 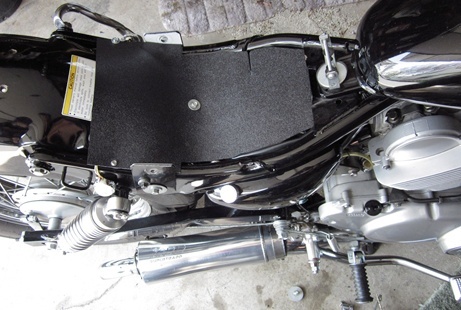 A cover with an opening in the front is a good idea for warmer climates, as it helps rear cylinder cooling. 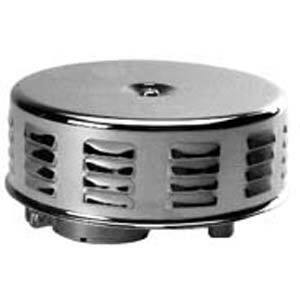 A 5.5 inch louvered air cleaner cover might look cool – as they are uncommon on bikes. 17) Add chrome air cleaner cover to the left side. 18) I keep thinking about how a plastic gas tank would reduce the weight of my bike ….. So I replaced the stock gas tank with a plastic gas tank from a Yamaha Warrior ATV. For pictures and information on this , please see this posting: http://wp.me/p1LWaM-lj A plastic ATV gas tank on a Virago 250 – how bad would it look? 19) Replace the 3 watt speedometer bulb with an LED bulb. 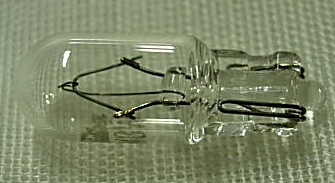 The stock bulb is Yamaha number 42X-83517-00-00. I think the number for the LED bulb equivalent is T6.5. I believe that Yamaha’s designation of “14v-34w” really means “14v – 3 to 4 watts“. 20) added 4/20/12 – My battery had less than 1/2 inch (13mm) of water !! (I removed it last night for the first time). I added about 10 to 12 ounces of water to it. It was working great before I added the water – I have owned the bike for a year and I had overlooked this important maintenance. 21) Is a $40 chain better than a $29 chain ? added 4/26/12 – If you follow my postings, you know I like cheap chains, as long as it is from a good company like DID or RK. The chain I bought last summer only has 3,600 miles on it and already requires adjustment every 400 or 500 miles, so I will probably get an O-Ring chain when mine wears a little more. I know, X-Ring is better, but they are out of my price range. My old chain cost $29.31 shipped and was an RK standard 520 chain, but I believe the chain was a lower grade than they normally sell. update 5/31/12 – I just got an O-ring chain for $40.35 shipped – but I did not drive my bike to work today due to my daughter telling me last night how dangerous my commute is. I did not feel like riding it today, so she must be right. The old chain weighed 4 pounds, the new one 4.5 pounds. Maybe the extra weight means it is more heavy duty, but weight is a bad thing for anything that rotates (tires, wheels, chains, flywheels, camshafts, etc.). Tire weight is even more important than wheel weight, because the tire is further from the center of the wheel. update 6/11/12 Compared to my old chain, the new O-Ring chain is smoother, has less drive line lash, has less noise, shifting is smoother, and the bike is faster now! Today on my commute, the bike went up several grades in 5th gear that required 4th gear before. Some people believe that an O-Ring or X-Ring chain can give you more performance (due to less friction) – so it is a great choice for the Virago 250 (or any small bike). Other people believe that a well-lubricated regular roller chain (not O-Ring or X-Ring) will give you more performance (due to less friction). Since I read this, I have been oiling my chain every one or two weeks. At some point I am going to try a non O-ring racing chain, and oil it once a week. The racing chain will be lighter and will maybe have less friction. 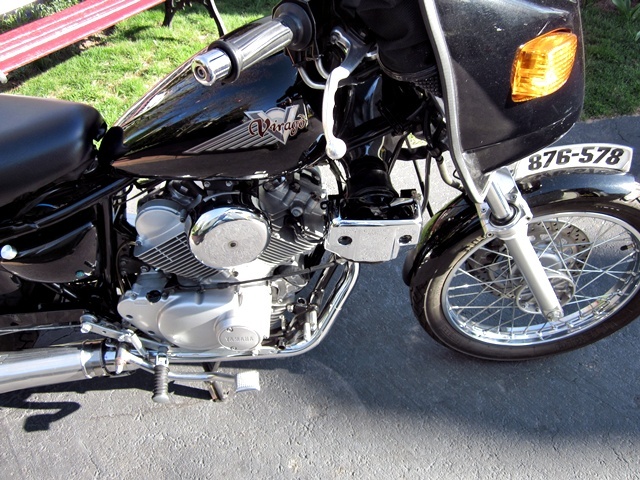 This entry was posted in Motorcycles and tagged Motorcycle safety, Supertrapp mods, Virago 250, Virago 250 Air Filter mods, Virago 250 modifications, Virago 250 turn signals, Virago 250 updates, Virago safety. Bookmark the permalink. Where did you get the air filter/cover in the photo (https://virago250street.files.wordpress.com/2012/03/on-right-is-vw-chrome-louvered-air-cleaner-2-x5-5-31-sq-in-foam-element3.jpg?w=150&h=116)? I’d like to get one. Thanks. If you search ebay for “VW Louvered air cleaner”, you should find it. The one on the left The six inch air cleaner cover on the left (covering the fuel pump) is actually from an old Harley, but many different covers will work – the optimum size to cover the fuel pump is about 4.5 to 6 inches (114 to 140 mm). I’ve got a question I think you could help me with! The VW air filters I’ve looked at all have only one opening for an extra hose, but my Virago 250’s chrome pod had two hoses attached to it… How do you get it all to work? Also, how exactly did you install yours? If you can answer, that would be awesome, thanks!! 1)The hose that goes from the upper left side of the carburetor is the one I would connect to the new air cleaner. Or you could connect it to a small filter (on ebay, search for “crank case filter”). 2)The crankcase vent tube is larger tubing and connects to the crankcase vent (about 2 inches from the oil filler cap). b) You could connect it to a “crank case filter”. c) You could just run the tubing behind and below the engine, without a filter. That is how I did mine. The crankcase vent does not need a filter in my opinion. The VW air filter inlet is a little bigger than the stock air filter, so you need to wrap something maybe 2 to 3mm thick around the inlet on the bike’s frame. I used rubberized electrical tape which is thicker than most electrical tape. Attach the tape so that it seals well – you don’t want any trash to be sucked into the carburetor. Then you need something like a tiny bungee cord to hold the air filter tightly against the frame. The bungee cord is needed because the inlet clamp by itself will not hold the air filter (same is true for the stock filter). I’m worried it might supply too much air, though, and that I would have to rejet the carb and lose a little bit of gas mileage in exchange for slight performance increase… It’s also a little bigger, but I like the idea that it has a cheap, replaceable foam element, and that it looks vintage and neat. Do you have any advice? Should I stick to the louvered air filter you have instead of this one? I don’t think too much air will be a problem. At some point, you will probably want to check your jets anyway. The foam will probably last a very long time. You need to oil it before use, and then clean and re-oil every year or so. When you receive the air filter, if you can’t wait to try it, you can just use motor oil if you want – but you should get real air filter oil (it’s more sticky) when you can. If you buy that filter, you need to have some sort of cover over the top and front section to block rain from above and from the front. In a medium to heavy rain, the foam could get soaked. If you make the cover to be easily removable, you could keep it on the bike and just put it on if it rains. It’s all done! Your advice worked great. After an oil change and the filter swap, my 250 runs like a different bike, I like it much better! I’m not sure how to post photos, but you can imagine what it looks like. It adds a sweet balance to the way the bike looks, with my big mirrors.